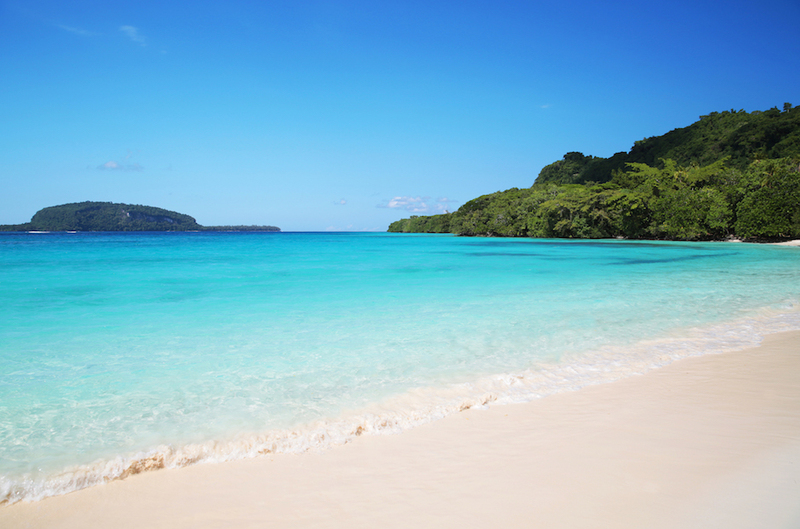 The archipelago of Vanuatu is a tropical haven for visiting sailors yet within reach of Australia. Vanuatu’s pristine waters and laid-back culture are very much in sync with the cruising philosophy. This chain of over 80 islands is a tantalising destination offering dazzling white sand beaches, reefs for diving, snorkelling and surfing; as well as smoking volcanoes, emerald jungles, and the opportunity to experience something profoundly removed from modern city life. Its location 1,200 nautical miles or about seven days’ sailing from Australia’s east coast makes the capital, Port Vila, a regular haunt of Queensland sailors. A myriad of international boats and yacht rallies call in on their way west across the Pacific. Port Vila’s sheltered anchorage offers marine services, a boat yard and good air links with Australia. Other attractions for weary voyagers are good hotels, resorts, international restaurants, lively bars and high quality golf courses. The region is, of course, in the cyclone belt, so boats often clear out from January to April for the north island of New Zealand, or further eastwards. The main sailing season is from Easter to Christmas, to avoid cyclones. The last major one was in 2015 but according to locals, Port Vila has fully recovered. The Melanesian islands and their friendly people have a rich and varied history which is reflected in colourful culture and customs. Historians think the original settlers island-hopped their way south from Papua New Guinea, passing nearby New Caledonia on the way to settle among the verdant green islands that Captain Cook called the New Hebrides when charting them in 1774. Britain and France went on to jointly administer them in an uneasy and duplicitous rule. In 1942, the islands were thrust into the Pacific War, with the Americans building a harbour, major naval base and airfield on Espiritu Santo, the archipelago’s largest island. The sinking of a troopship, converted luxury liner SS President Coolidge, in October 1942, inadvertently created what has become one of the world’s greatest dive wrecks. Tourism has become the island’s main industry, having grown strongly after independence in 1980. Today the modern democratic parliament house stands high above the capital of Port Vila, renowned as one of the prettiest capitals in the Pacific. Down below, in the sheltered, deep-water bay, sit dozens of cruising yachts flying the flags of many nations. Their numbers will be boosted in July by 38 yachts from the World ARC Rally. With the prevailing southerly winds in the dry season, the World ARC sailors, like most others, take a northerly route after their voyage west from Fiji. They call in at the volcanic island of Tanna, a day’s sail south of Port Vila. Port Vila is a deep-water haven, protected by outlying islands. Its busy boatyard bustles near the container and cruise ship port on the peninsula. The thriving town has several New Zealand and Australian businesses including an ANZ bank and plenty of ATMs for easy withdrawal of the local currency, the Vatu. The legacy of French involvement means food and drink is interesting, with two Au Bon Marché stores well stocked for the visiting sailor to resupply with. But prices are generally a little higher than in Australia, understandable given that everything comes a long way by container ship. The town is nestled in palm trees along the wide bay, with several popular hang-outs for sailors. Good coffee and free wi-fi ensure the popularity of the Nambawan Beach Cafe, with its adjoining craft market. Not far away the acre of undercover fruit and vegetable markets throng with shoppers buying whatever is in season – taro, coconut, stalks of banana, papaya and more. Accommodation is plentiful with a good choice of reasonably priced hotels. At the top end the Sebel dominates the town with its high-rise cocktail bar giving revellers views across the anchorage and outlying islands. Up the hill is the more traditional hotel The Melanesian – basic yet comfortable, with friendly staff. Some international restaurants overlook the anchorage. The local sailing scene is centred around the Vanuatu Cruising Yacht Club, housed in the rumbustious Anchor Inn at the north end of town. This is where you’re likely to find a barbecue coinciding with a footie match or a day at the horse races; a popular sport and pastime on the island of Efate. Marine services in Vila are supplied by the friendly staff of Yachting World, led by smiling manager Lemara and her dock team. The locally-run company has a fuel dock as well as supplying all necessary services (moorings, marina access, power, water, internet, and book swap). It was interesting to hear Lemara’s comments on their clientele. “We have many repeat visitors here and they mostly stock up their boats before heading out to the islands,” said Lemara. She has observed that in cyclone season the moorings are sunk to protect them, and the bay quietens. Ideally, an all-weather public marina will one day be built but two private marinas are underway presently. Adjoining the company’s office is the Waterfront Bar and Grill, a popular watering hole for the yachts moored stern-to at the quay. Navigation can be challenging because unlike Fiji there are no fringing reefs to reduce swell. The lack of navigation lights plus anchoring can require a lot of rode. Other comments I gleaned from sailors touched on a lack of accurate charting even though there are local pilot guides. These issues were a few of the reasons why a major charter fleet hasn’t been sustainable – but there are individual boats and skippered charters. Traditional village life and culture or “kastom” is the way 80 percent of the population lives. The southern island of Tanna is a typical example of this, where the village chief conducts arbitration using the island’s own dialect, or Bislama, the official language of the nation, along with English and French. 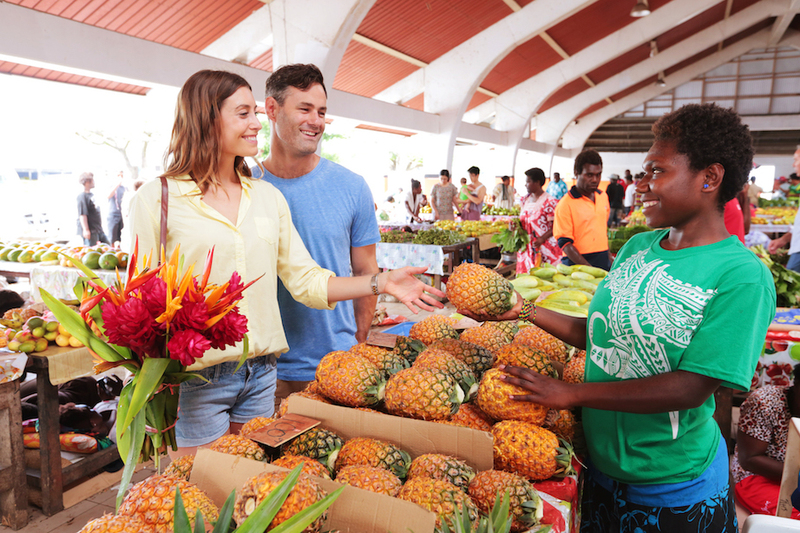 Following local etiquette is important for arrivals so the exchange of gifts and asking permission when moving around the islands is essential courtesy. Coral navigation is always best done in daylight and the dangers are apparent, with the approach to Tanna’s custom entry, Port Resolution, rather coral strewn. But once safely in Tanna further advice can be had from the Port Resolution Yacht Club. Local man Stanley (the chief’s son) is the yacht liaison, and Werry Narua is the owner of the yacht club. Cyclone Pam devastated the island in 2015 so rebuilding is on-going. 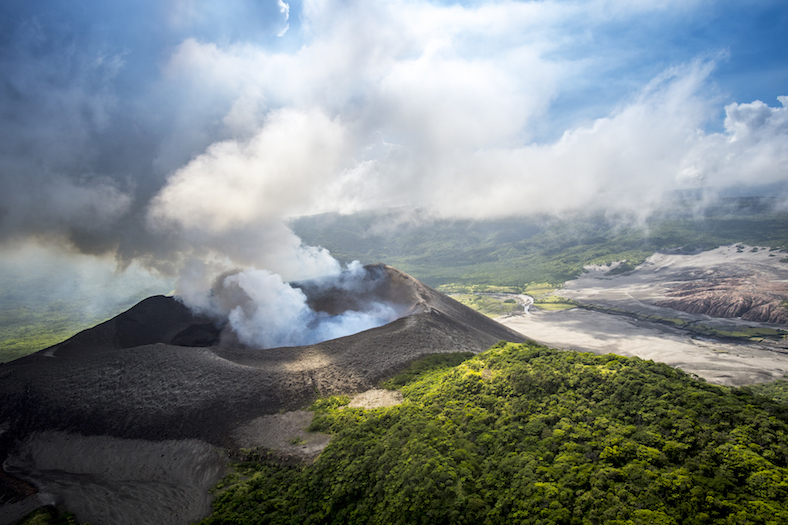 Tanna is famed for its live volcano and pristine natural beauty, the main attraction being Mount Yasur (361m). This is one of the most accessible volcanoes in the world for sailors, as it’s not too far from the anchorage and has a four-wheel drive track most of the way up. The volcanic region was in the news during May when the far northern island of Ambae was evacuated because of ongoing eruptions. Cruising sailors often sail north with the southeast trade winds, finding good anchorages on the way to Espiritu Santo. “The snorkelling on Lelepa island was some of the best we’d seen,” recalled Michelle Poncini and family from the sloop Carl. Highlights for the Poncinis were arriving in Santo to swim with the dugongs, then catching a lobster for dinner. “Port Olry on northeast Santo is a fantastic anchorage, and really feels like the back-blocks,” said Michelle. The couple used the anchorage as a jumping off spot for Waterfall Bay in the remote Banks Islands. “Our kids loved the contact with local children,” she added. Leaving Tanna, yachts moving north through the group can anchor at one of the biggest islands in the group, Erromango, and its west-facing bay at Port Dillon, where flights arrive from Port Vila. The mountainous and sparsely-populated island has good bush walking, a pastime that is growing in Vanuatu. With so many other islands and hundreds of anchorages throughout Vanuatu, the cruising sailor would take several seasons to explore thoroughly and see all the sights. They include witnessing the drama of the famed sky divers of Pentecost Island, (the raw precursor of modern bungy jumping); and visiting the diving nirvana of Espiritu Santo. Santo, as the locals call it, was where American author James Michener was stationed during WWII, inspiring him to write Tales of the South Pacific. As a visiting sailor I certainly felt inspired by the entire region and its ever-smiling people, the lovely Ni-Vanuatans.